Holden Research and Consulting tested the performance of a product containing SumaGrow&REG; on broccoli production. This trial compared a product containing SumaGrow&REG; in three different treatments: grower standard (100 percent fertilizer), grower standard with SumaGrow&REG;, and a 20 percent reduction in grower standard with the addition of a SumaGrow&REG; product. While the broccoli head weight was essentially the same for the first two treatments, when SumaGrow&REG; was added to a reduced fertilizer treatment the yield increased by 9 percent. 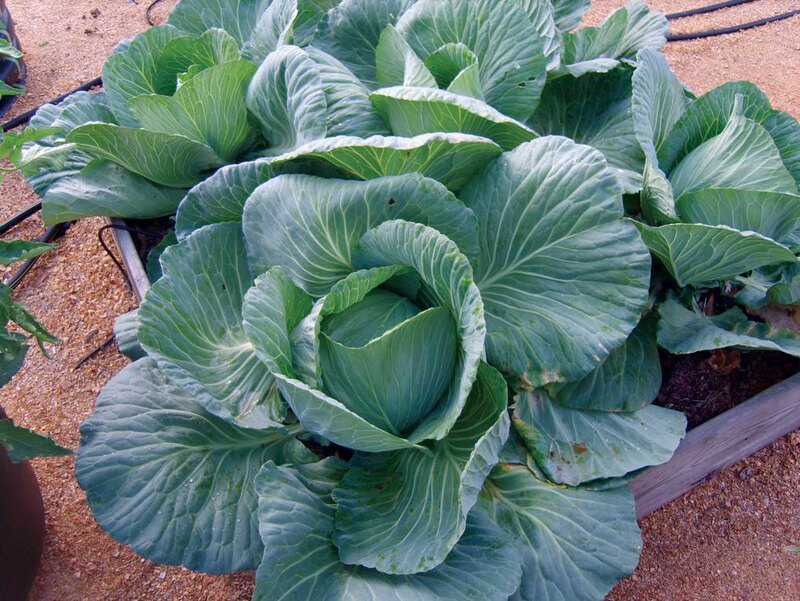 Holden Research and Consulting tested the performance of a product containing SumaGrow&REG; on cabbage production. This trial compared a product containing SumaGrow&REG; in two different treatments: grower standard (100 percent fertilizer), and a 20 percent reduction in grower standard with the addition of a product containing SumaGrow&REG;. Cabbage root mass of treated plants increased by 102 percent). Holden Research and Consulting tested the performance of a product containing SumaGrow on celery production. This trial compared a product containing SumaGrow&REG; in two different treatments: grower standard (100 percent fertilizer), and grower standard with the addition of a product containing SumaGrow&REG;. Significant improvements in plant development and sizing were recorded. This greenhouse trial was conducted in Yunatsite, Bulgaria on cucumbers. The trial was conducted by Farmorganix, a licensee of Bio Soil Enhancers, INC to determine the efficacy of using products containing SumaGrow&REG; for field and greenhouse production. The trial data showed a 26 percent increase in yield for SumaGrow&REG; treated cucumbers with accompanying increases in leaf mass and plant greenness which relates to more photosynthetic area for the plant. It was also noted that the SumaGrow&REG; treated plants fruited an additional 14 days longer than the control. 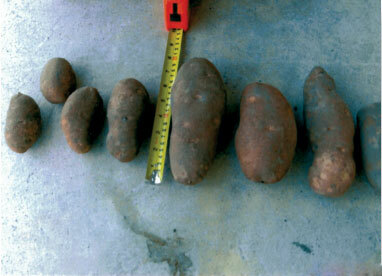 Research was conducted on the effects of products containing SumaGrow&REG; on Russet potatoes in Minnesota. An increase in yield and value were both noted. 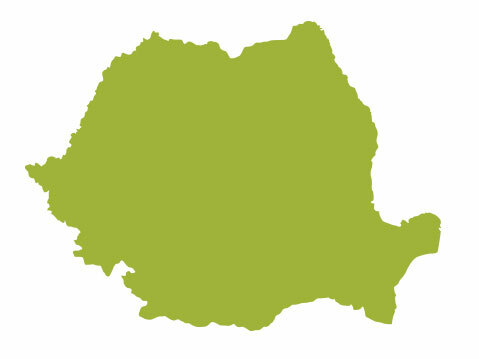 The Agricultural Research Station Pitesti-Albota conducted research to determine the response of potatoes when treated with products containing SumaGrow&REG;. 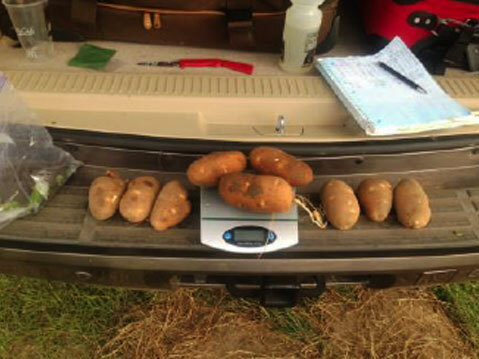 The treated potatoes yielded a net profit of $45.73 more per acre than untreated potatoes. 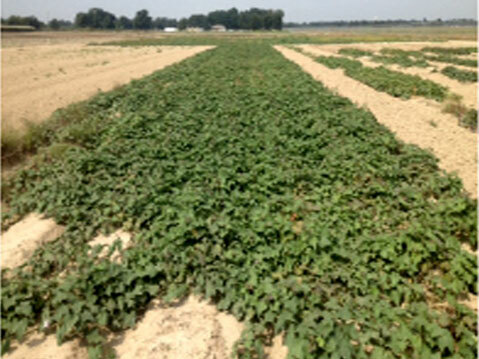 In 2014 a trial with products containing SumaGrow&REG; was conducted on three different varieties of sweet potatoes in North Mississippi. The results indicated a positive improvement of the yield and an overall increase in the total marketable yield. Research was conducted to determine the response of beefstead tomatoes when treated with products containing SumaGrow&REG; versus the grower standard. Results indicated an increase in yield over the grower standard alone. Research was conducted to determine the response of tomatoes when treated with products containing SumaGrow&REG; versus the grower standard. 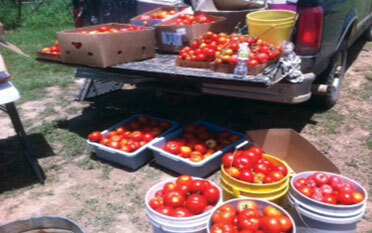 SumaGrow&REG; with a 50 percent reduction in the grower standard showed the highest increase in price yield. 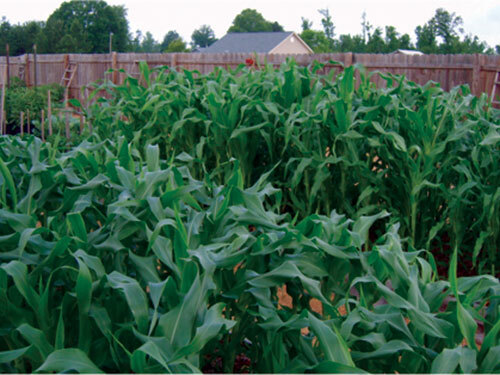 A study conducted by Mississippi State University looked at the necessity for fertilizer reduction. They utilized four treatments: SumaGrow&REG; with 50 percent fertilizer, SumaGrow&REG; with 100 percent fertilizer, 50 percent fertilizer only, and 100 percent fertilizer only. The results were supportive that SumaGrow&REG; works best with a reduction in fertilizer use. 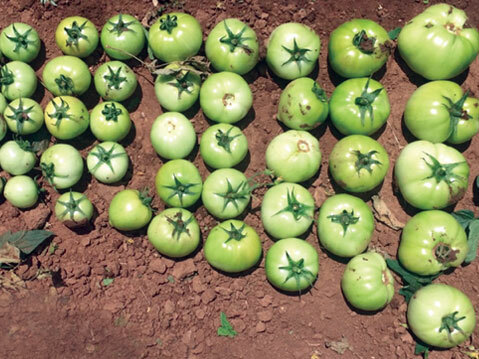 The SumaGrow&REG; with 50 percent fertilizer producer a higher tomato yield than the other treatments. Hi Wayne: What do you think of these potatoes? Richard Nellett brought these pictures to me yesterday and he was amazed. They leave their potatoes in the ground and dig them when they need them which looks like it was the end of November according to the date on the picture. He had no idea they were that big until he dug them up for dinner! His wife said that was the first time she only needed 2 potatoes for dinner. I thought they were sweet potatoes, but he said that they are regular potatoes. They measure almost 8 inches long. The ones on the left, of course, were grown without SumaGroulx, SumaGrow&REG; inside. He said it was no special seed potato, just what they had left over and he wasn’t all that careful about he applied the SumaGroulx, SumaGrow&REG; inside, just poured it around the plant. I thought you might find this interesting. 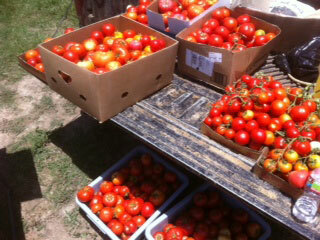 Pam and James Barr picked over 1,000 lbs of tomatoes in one thankful, yet exhausting day. James and Pam have owned Barr Farms, a family dairy, for over 30 years and decided last year to grow their family garden into one for resale purposes. 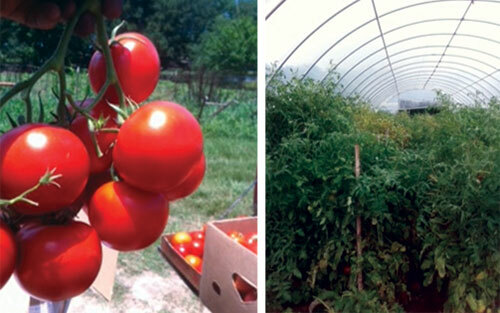 Moving forward with their vision, they purchased a 30 by 96 foot high tunnel last fall with a cost-share from the Natural Resources Conservation Service that stipulated that all produce must be grown using organic methods. 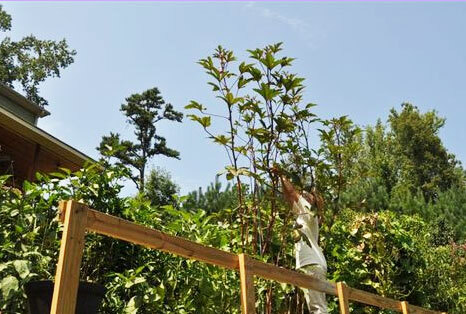 Pam chose to use only a product containing SumaGrow&REG; . “We were introduced to SumaGrow&REG; products about three years ago and loved the results,” Pam said. She expected good results, but was concerned what the extreme heat would do to this year’s crop. After seeing a news article on TV about your product, I decided to give it a try. I have a raised bed vegetable garden in the back yard of my home. I’ve gardened this way for the last several years. It has always been a successful way to garden, but I have never had such dramatic resutls as I have seen since using your product only one time! The plants are greener, healthier, and stronger than they have ever been. They are larger, and each plant is loaded with fruit. I was very skeptical about the product in the beginning, but I believe it will be a beneficial tool in gardening vegetables and flowers. All my plants have grown so green and so sturdy that I cannot wait to see the harvest. Bio Soil has made a believer out of me. I have not used any commercial fertilizer at all and still have these great results using your completely organic product. Richard Nellet farms 700 acres of corn and navy beans in Munger, Michigan. “We treated half our crops with “SumaGrow&REG;” and the results simply amazed us. We are seeing a 20 percent better yield on the SumaGrow&REG; treated crops at a lower cost because the SumaGrow&REG; costs less than the conventional fertilizer we have been using. Next year I am going to treat all my crops with SumaGrow&REG;. The seed packet said okra can get to six feet. I just measured ours at 12’ 6” — and delicious!!! A distributor for EarthCare Natural, SumaGrow&REG; inside, reports in from Panama. The zucchini matured in 40 days instead of the normal 60ish days. Since they grow year round in Panama, this earlier maturation alone is equivalent to a 50% yield increase. 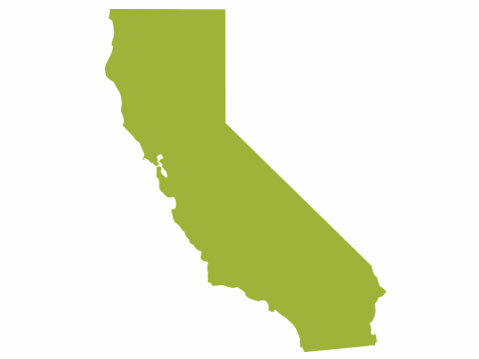 EarthCare also reports on a bok choy trial in California, applied and supervised by a third party, a major ag/chem distributor in the U.S. The crop matured in 36 days instead of the normal 45 days. Again, due to year round growing, this earlier maturation benefit is equivalent to a 25 percent yield increase. There was also an actual yield increase, fertilizer reduction and better taste. 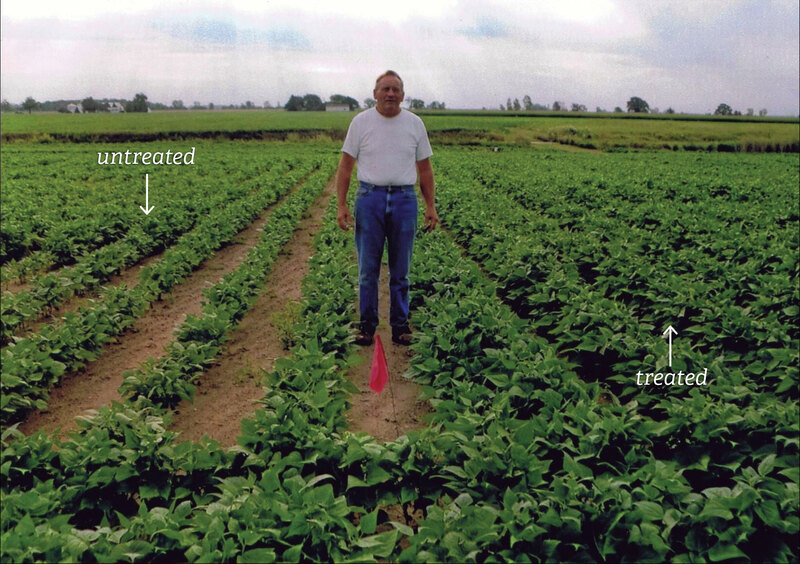 Promised Land, using Genesis, SumaGrow&REG; Inside, showed an increase in profit of over $70/acre, without adding in the fertilizer reduction on soybeans. From Italy, the Agriculture Institute, Prever-Osasco, performed multiple replicates on five different potato varieties, whichaveraged a 13.4 percent yield increase using Solum Natural, a Grow Pros label. Tall Harvest in Vietnam reports good results on dragon fruits, coffee (both old and producing trees), black pepper, and pearl onions. And from Cambodia, a longan tree (similar to lychee, not to be confused with Loganberry) plantation owner loved the early results. Billie Davis, a farmer in Dover, Florida has been growing collards, mustard, scallions and black eye peas on his farm for 45 years. "I have a set of plants currently in their second week of flowering that have been receiving foliar application of your product once a week followed by a daily misting of reverse osmosis purified water until their due for their next feeding. I started them on this program as soon as they became well rooted clones. I must tell you...I am absolutely amazed! The video testimonials below were filmed at the annual International Conference for Sustainable Agriculture (ICSA).